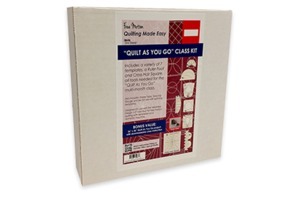 Quilt like a pro with our 9-piece ruler foot kit for free motion quilting and INCLUDED exclusive Brother “in-box” education. Includes a variety of seven templates, 1 ruler Foot, 1 Cross Hair Square, 4+ hours of training with download key*, and 2 DVD set of educational Videos. This perfectly circular free-motion foot allows you to sew a constant 1/4" away from the edges of your ruler templates.